This page provides technical information about the Odyssey web application's online help. https://odyssey.uwaterloo.ca/overview/ - documentation about the examination management system and graduate application system. http://www.postgresql.org/docs/current/interactive/ - documentation for the version of Postgres we are using. Section II on SQL, Chapter V.40 on PL/pgSQL, and Chapter VI.I. on SQL Commands are likely to be especially useful. https://docs.python.org/2.7/ - documentation for the (major) version of Python we are using. OdysseyIntroduction - notes from initial instruction into Odyssey. The help files are primarily in HTML format and are located mainly in the help subdirectory under the application root. A Git repository for the Odyssey project has been created on UW's GitLab. Although the repository has already been created and shouldn't need to be created again, this segment documents the process that was used to create the repository as an example in case you need to create other repositories on GitLab. In this first phase, we'll create a repository for the whole Odyssey application, but we'll deposit only the documentation. Source code and other project files can be added later. We're going to copy files and directories from the live implementation to the workstation. On your workstation, create a directory called "odyssey". This will be the root directory of the repository. The whole application, with its entire directory structure will eventually be under this directory. Under "odyssey" create a directory called "doc". This will be the documentation branch of the repository. Later, sibling directories (project, java, etc.) can be added to hold the application files. Install Git on your local machine if you haven't already. Open a command window and configure Git with your name and e-mail address, if you haven't already. >git config --global user.name "Joe Schmoe"
>git config --global user.email "jschmoe@uwaterloo.ca"
Go to the "odyssey" directory that you created in Collect the Files On Your Workstation, above. Turn this directory into a Git repository. This will create a ".git" directory under "odyssey", where versions, state, and history will be stored. Add all of the contents of the current directory (odyssey) to the repository. >git commit -m "Initial creation of repository. Documentation only." Create a README file in the "odyssey" directory on your workstation. It is written primarily in Python and uses a PostgreSQL database and an Apache web server on a Linux host. If you would prefer to use a richer document format than plain text, name the file "README.md" and use GitHub Flavored Markdown (GFM). Add the README file to the local repository. >git commit -m "Added README file"
In a web browser, go to https://git.uwaterloo.ca/. Sign in on the LDAP tab, using your WatIAM credentials. If they fail, have an administrator set up access to GitLab for you and try again. On the Your Projects page, click the New Project button. On your workstation, define a remote repository called "odyssey", pointing to our new GitLab repository. Push the local repository to the remote repository. Compressing objects: 100% (127/127), done. Writing objects: 100% (141/141), 567.36 KiB | 0 bytes/s, done. Branch master set up to track remote branch master from odyssey. To make a development copy of the Odyssey project on your workstation, follow these steps. Get access to the CSCF Git Repository. You will have to be added as a user by someone with authority, such as Daniel Allen. You will also need to provide an SSH key for your local machine. If you have not already done so, install Git on your local machine. If you have not already done so, configure Git with your name and e-mail address. Open a command shell in Linux or DOS. In a command shell, go to the directory under which you want to put your Odyssey repository. This will create an odyssey directory at your current file system location, with the project under it. The odyssey directory is also your local copy of the repository. There are a variety of workflows that one can use with Git, some optimized for collaboration among many project participants and overkill for our purposes. The centralized workflow is a reasonable place to start; the basics are detailed just below. Since it is likely that only one person will be working on Odyssey documentation at any time, you can simply update your local working copy, stage the changes using the git add command, commit them to your local repository with the git commit command (or combine those two with git commit -a), and then push them to the central repository on GitLab. Do your editing and development right in the odyssey directory and its sub-directories in your working copy. As you complete changes, add them to your local repository's staging area. The stage is a list of files that have been modified, but have not yet been committed to your local repository. Git keeps track of them. When you have a complete and integral set of changes in the stage, commit the changes to your local repository and then send them to the Odyssey repository on GitLab. Here's a walk-through example. We'll modify the project's README file. Verify that you have a remote called "odyssey" pointing to the GibLab repository and, if not, define it. Refresh your local repository and your working files from the central repository on GitLab to ensure that your files are current. Edit a file. Let's add a note to the bottom of the README file, indicating how to define a Git remote for the repository. Stage the changed file for updating in the local repository. You might repeat steps 3 and 4 several times, making and staging changes to various files, before you commit them to your local repository. Commit all staged files to the local repository and include a message describing the change. >git commit -m "Added Git note to README"
Push the update to the master branch of the central repository on GitLab. Writing objects: 100% (3/3), 429 bytes | 0 bytes/s, done. An automated deployment method using scripted Git commands to pull updates from the GitLab repository is possible. When the main Odyssey project—source code, schemas, etc.—has been added to the GitLab repository that current contains only the documentation, there may be multiple people working on different aspects of the project. Then a more complex (and more common) Git workflow involving multiple branches—one master branch and one or more development or 'feature' branches—and merging may be in order. (The WWW is replete with workflow descriptions and examples.) That's when you might need some of the more advanced features and commands of Git. Here are some handy resources. 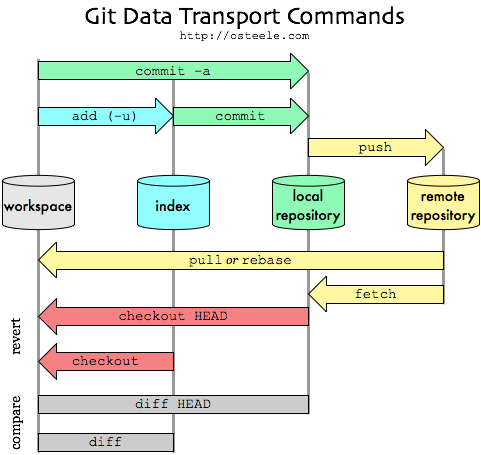 Here's a succinct summary of the most common Git commands in an easy-to-grok diagram.